Jemima Khan helped give Twitter its biggest day ever this week. More people logged onto to Twitter to find out about the alleged “superinjunction” than in the short history of this social website. And the person who had Tweeted about her and Jeremy Clarkson – a so-called “Billy Jones” – attracted over 30,000 followers within 12 hours of his account going live on Twitter, Currently, his collection of just six Tweets is followed by over 100,000 people – all within a week of him setting up his account. If you look at his Tweets you can find personal allegations about celebrities who he says have been involved in “gagging orders” – and there has been much associated media coverage in the past few days claiming how a simple 140 characters has brought the legal world to its knees. That’s something I wrote about three months ago – shame they are behind the times. What is much more interesting is why this simple collection of Tweets – that could well be made up – attracted such immediate and massive attention. There are two reasons and they show exactly what you need to do on your website to attract readers and visitors. Firstly, the Tweets are all about people; they have huge “human interest”. People are interested in other people much more than anything else. Fill your website with human interest and you will get many more visitors than if you fill it with business stuff. If you are an accountancy firm, talk about your customers as individuals; if you are a law firm, talk about specific legal cases. Obviously, unlike the superinjunction writer, get permission first, but the more your business writes about other people, the better. The second reason why the Twitter account was so quickly successful was mass media interest. 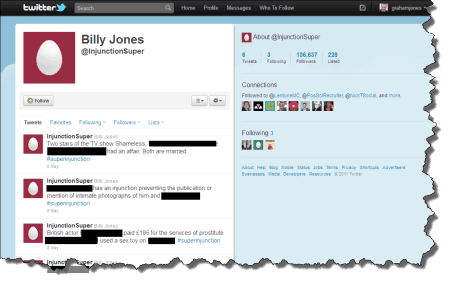 Few people would have known or followed Billy Jones without the front page coverage and TV reports of his humble six Tweets. The more offline media coverage your business gets, the more traffic your website will receive. Significant amounts of web traffic result from media coverage of a subject. Get your business in the media and you will get an increase in web traffic. Oh – and what is the most popular subject in the media? Human interest, by far. What a coincidence…!